IBM today announced that for the fifth consecutive year, IDC ranked the company number one in worldwide market share for enterprise social software. According to the press release, IDC's analysis of 2013 revenue, the worldwide market for enterprise social software applications grew from $968 million in 2012 to $1,242 million in 2013. 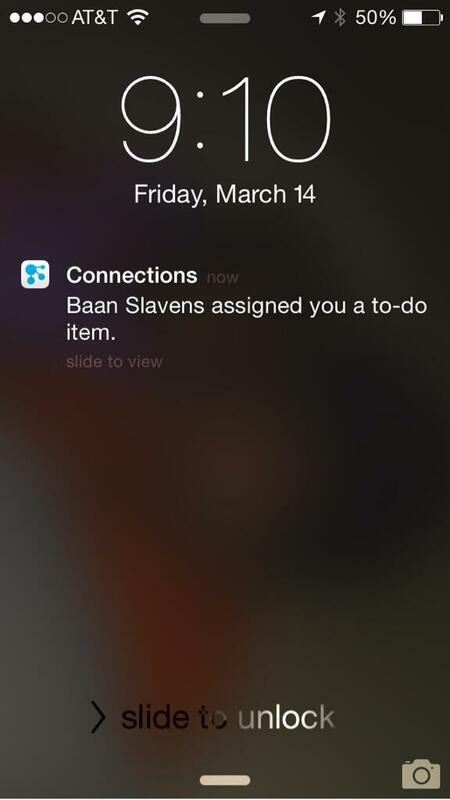 Customers are increasingly assuming that all applications must be social. IBM's focus on a core social networking platform to support application environments, such as Smarter Commerce and Smarter Workforce aligns well with this customer intent. The news comes in timely as we are getting ready to unveil IBM Connections Next on May 21st. If you haven't yet, register for our virtual event Collaborate or be Left Behind: Leading the Digital Frontier. 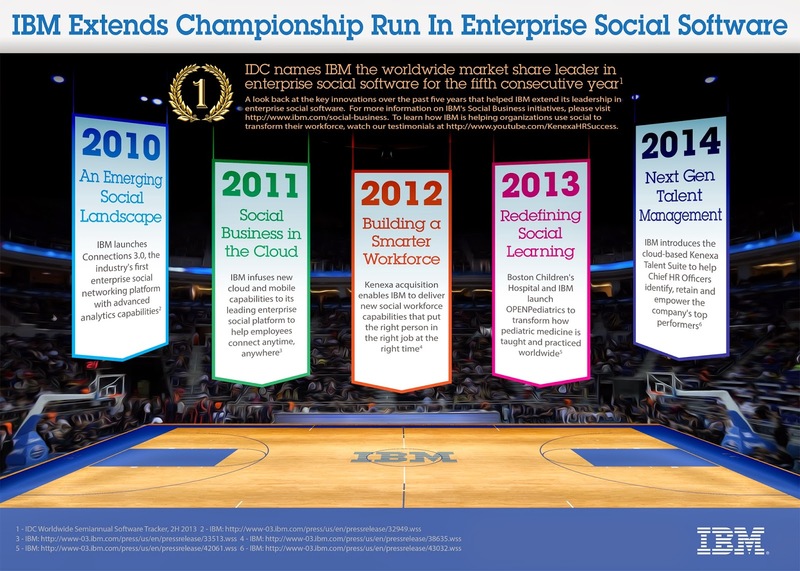 IBM's Social Business portfolio, including its industry leading IBM Connections and Smarter Workforce technologies, allow organizations to integrate social solutions with critical business applications and people-centric processes that empower employees, increase workforce productivity and deliver exceptional customer service. Deployed on cloud or on premises, these solutions also enable business leaders like the Chief HR Officer (CHRO) to attract and retain top talent when combined with social workforce analytics that ensure the organization has the skills and expertise to meet emerging market demands. The transparent nature of today's business environment, combined with the integration of social, cloud and analytic capabilities into everyday processes, has fueled the emergence of a Smarter Workforce. We’re thrilled to be recognized by IDC as the market share leader for the fifth consecutive year as our clients continue to harness Social Business to accelerate innovation, increase agility and remove boundaries to collaboration. Want to see what's coming in the latest release of IBM Connections? Then don't wait and register today and see you on May 21st. As I announced back in March, I'm going to Social Connections VI - the IBM Connections User Group. Last week, the organizers announced the agenda and I'm extremely honored to be part of the keynote. As you can see from the agenda, I want to deep dive on IBM Connections "Next" and not just what it is, but why we built it and why you need to get it now. As I mentioned earlier this week, on May 21st we'll be hosting a 1 hour webcast to unveil IBM Connections "Next" and if you haven't registered yet, you can register here. Now, don't let that hold you back from registering for Social Connections VI. The organizers have created a super awesome and packed 2 day agenda and the event is free so all you need to do is get yourself there and get some best practices, tips, tricks, ideas, and more from fellow IBM Connections users. To start signing up for sessions and build your calendar, go here. I've already taken a pass and there's so many good sessions, that I have tons of conflicts that I'll need to resolve once I'm there. If you haven't registered for Social Connections VI yet, go ahead and do it now! Mark your calendars: Introducing IBM Connections Next ! In less than a month, IBM will be introducing the newest, latest, and greatest release of IBM Connections. 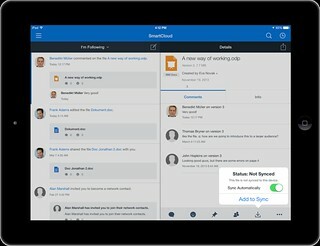 Some of the latest capabilities were shown during the keynote demo at IBM Connect 2014. Now, it's time to unveil everything that we've been working on for the past year or so and bring it to you. The official unveiling will happen on May 21st so mark your calendars ! As we've done in other years, we'll host a virtual web conference and walk you through the new business challenges that IBM Connections can help solve for you. At this point, I can't say too much about the new release besides what you may already know from IBM Connect 2014. If you liked that, feel free to take the video above and embed in your own IBM Connections blogs, wikis, forums, etc. Spread the word! Get 5 minute tips on IBM Connections -- every day! If you got here, you are either a regular subscriber to this blog, a fan of IBM Connections, or you are looking for tips and tricks to get the most value out of the enterprise social collaboration platform. Maybe you have a question on how to drive adoption, how to tune your email notifications, how to better structure your community navigation, or you are looking to learn more about IBM Connections. Jim Claussen, a colleague of mine in IBM, has decided to take it upon himself and created the AskJim podcast to provide 5 minute answers to IBM Connections questions -- daily! For the past 4 weeks he's kept up the pace and has produced 30 episodes so far. To listen in you can just do it directly from here (see below) or you can download the SoundCloud app for your mobile device (iOS and Android). You know you want to listen to these episodes while on the go, working out, etc. Oh and if you listen to episode 14, you'll learn how to embed this podcast directly on your Connections community so that all your community members can get value out of it!! Let me know what you think and send questions to Jim via Twitter if you want your own question to be answered. Over the weekend, IBM had a run of ads in print media and on TV with many different spots going throughout the Masters. 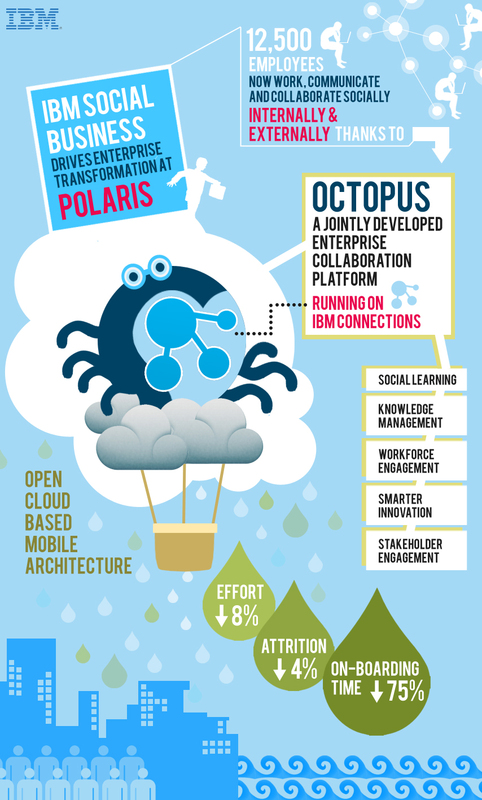 The spots were around IBM's 4 big areas: Social, Cloud, Mobile, and Big Data. It was fun to hear from my friends and family who had seen the spots and mentioned how it was really hard to miss the IBM spots. The spots highlight customers and scenarios that are being Made with IBM. If you are not a golfer and want to watch the entire series, check out the IBM channel on YouTube. Additionally, check out the Made with IBM site for more details and customer stories, such as this one on how Princess Cruises is optimizing their operations with social. Below, I've included 4 videos that are specifically around social business, powered by IBM's enterprise social collaboration platform, IBM Connections. Work is quickly ramping up as the product management team is working on the go to market activities for IBM Connections "Next". For example, yesterday I was working on updating the current IBM Connections Reviewer's Guide with information about the new release. I also submitted two abstracts for the upcoming Social Connections VI user group meeting, which I hope get selected, but more on that later! In case you don't know by now, my background is in app development and I wanted to take an opportunity to share a couple of new items in the IBM Connections SDK. First, a pre-release of the iOS SDK is now available so that you can build your own iPhone/iPad apps as seen in the screenshot below. Second, those of you developing for on-premises servers, the latest version of the QuickStart image which has Connections and Sametime all pre-installed is now available on SoftLayer. And for those of you PHP lovers, there's now a PHP version of the IBM Connections SDK. Use the IBM Connections Banner in Custom Apps - One of the key aspects of building a custom app is integrating with the look and feel of the overall platform. IBM Connections in the Cloud provides a simple way to incorporate the main navigation into your own app giving end users a single, integrated end user experience and all you need to do is include a couple of lines of code! Extending the User Interface of IBM Connections - IBM Connections in the cloud provides various extensions to make it super easy to extend the user experience. For example, let's say that you want to add a "Send a Thank You Award" button in someone's profile. A couple of clicks and voilá. A couple of hours ago, IBM Connections 4.5 CR4 was made available. This new cumulative release introduces various new features, two of which specifically for mobile that I would like to focus on. It's worth noting that these features are already available to our cloud customers so we are just wrapping these up and giving them to our on prem customers. First, push notifications alert you when you have a new to-do (as seen below in the image), when someone asks to join one of your communities, or someone invites you to join their network. Additionally, you can now select individual files to sync and work while you are offline. When syncing, the server will do a differential sync. That way if one of your co-workers updates only 1 slide in a 50MB presentation, only the particular slide that was changed will be sync, saving you time, battery, and bandwidth. If you don't have unlimited 3G/4G/LTE plan, you can also choose to sync only while connected to wifi. Finally, you can also pick and choose which files to sync to which device. For example, you may only want 2-3 key presentations on your Android phone (or iPhone) while having 20-30 documents on your iPad where you can more easily edit the files. To see what else is new in IBM Connections 4.5 CR4, go here. To configure File Sync and push notifications, see the documentation here.